The city of Jodhpur, founded by Prince Rao Jodha, is surrounded by a ten kilometer wall. 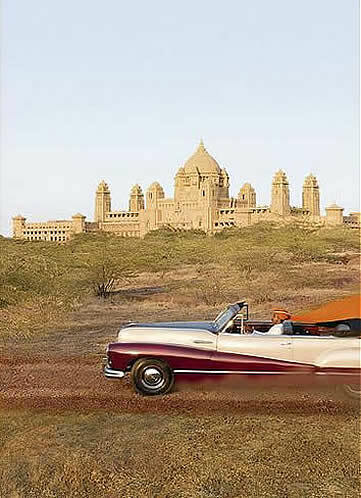 The Umaid Bhawan Palace, home of Gaj Singh, the Maharaja of Jodhpur, is one of the largest private residences in the world, with a cupola that is more reminiscent of a Renaissance cathedral, than a desert home to royalty. Jodhpur was quite a change from what we had previously experienced in India. It was cleaner, less crowded, more structured, and less intimidating - a nice respite from the hustle and bustle of Delhi and Agra, and more akin to sister city Jaipur. Our Jodhpur hotel was the Umaid Bhawan Palace, because it was difficult to imagine a hotel more romantic than the former home of Gaj Singh, the Maharaja of Jodhpur, who still resides there in a private wing. 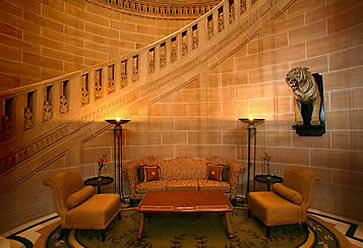 It is one of the largest private residences in the world, set amidst 26 acres of lush gardens. Designed by Edwardian architect Henry Lanchester, for his grandfather Maharaja Umaid Singh it is a blend of eastern and western influences: a majestic, Renaissance-like one hundred and five foot cupola, set between sandstone towers inspired by the Rajput tradition. The palace looks like a cross between the White House, a Rajasthani palace and the British Houses of Parliament, belying his grandfather's penchant for copying the best. 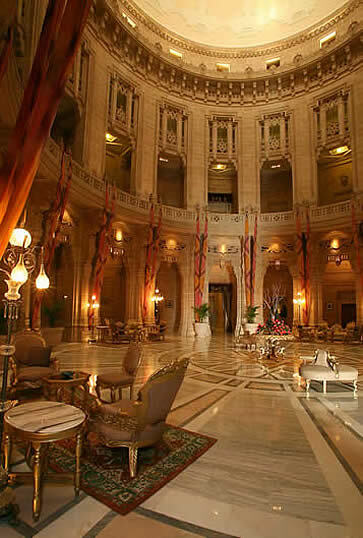 Considered a national monument, it has its own private museum, a well-stocked library, multiple lounges that once serviced the royal family, and a subterranean pool and spa. Gaj Singh became the Maharaja at the age of four, upon the death of his father. I had the opportunity to interview him and found him to be engaging, remembering with tenderness that the most significant thing about his change of status at such a young age was that he never lost another game of anything against anyone. He spoke with great pride about his favorite visitors to the palace over the years: Jackie Onassis Kennedy, Prince Charles, and the four Queens of Bhutan, to name a few. He shared with us some secrets about our accommodation. The immense vaulted dome has a whisper gallery, he told us, and every pillar was constructed with interlocking sandstone, set in place with dry ice in between so that they could be aligned gradually and exactly as the ice melted. He explained that after thirteen years of construction, awaiting only the custom-designed furnishings and decorations imported from England, the container ship carrying everything was sunk by the Germans in 1942, yet his grandfather still managed to replace everything in time for a Christmas Eve party that year. The city of Jodhpur itself was well-planned and well-fortified. It was founded by Prince Rao Jodha on a rocky range of sandstone hills in 1459. A wall, 10 kilometers long, 2.7 meters thick, ranging from 4 to 9 meters in height, surrounds the city. The wall has seven gates, flanked by bastions and fixed with pointed iron spikes. The outstanding feature of Jodhpur is its Fortress Castle (called Mehrangarh Fort), situated on an isolated rocky eminence 122 meters above the city. The Fort contains many well-preserved period rooms, the most beautiful of which is the Phool Mahal, which was in all likelihood a private and exclusive chamber of dancing girls, who entertained royal guests under a ceiling rich in gold filigree. The Phool Mahal was created by Maharaja Abhaya Singh (1724-1749) and the gold came from Ahmedabad in Gujarat as war booty after his famous victory over the rebellious Mughal governor, Sarbuland Khan. The paintings, royal portraits and the ever-popular raga mala, came much later, in the reign of Jaswant Singh II. 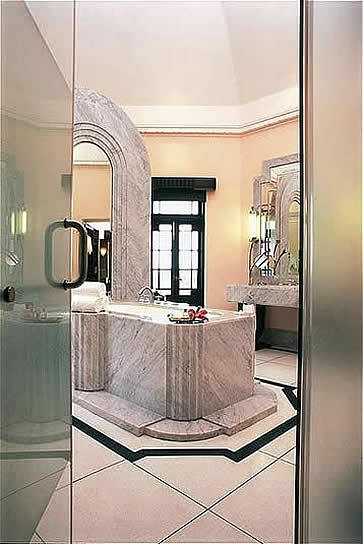 Why you'll love it What could be more romantic than staying in a Maharaja's palace. Good to know It's still the home of one of the royal families. Dining The Risala Restaurant presents Indian cuisine in an intimate, elegant environment and you can choose to eat outdoors on a fine night. How to Get There Private car from Jaipur. 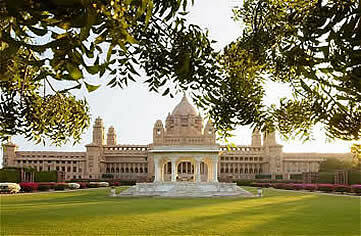 Hi, The Umaid Bhawan Palace looks wonderful. Do you have any rooms available in March next year? Thanks. Maharani Art Exporters is a government recognized export house that has an incredible selection of fabrics on multiple floors. Make sure at least to make it to the second level. Things may seem a bit haphazard, but they'll show you the different products they have and you can choose what you like. Then they'll show you a myriad of color choices. They also have antiques, wooden and iron furniture. Address Tambaku Bazar, Jodhpur, India. Manufacturers of handloom cotton, silk and wool durries. Roopraj Prajapati is a local carpet weaver and a hero of the community of Salawas, a few kilometers from Jodhpur. He has single-handedly taken his grandfather's talent for carpet weaving and turned it into an international industry recognized by the rich and famous. His perseverance kept the industry alive at a time when it was threatened. Post-independence, when the Maharajas lost their power (and began losing much of their wealth) their carpet weavers had a hard time making a living and the art was almost lost. Gems and Art Plaza has a fine selection of gold and silver jewelry. 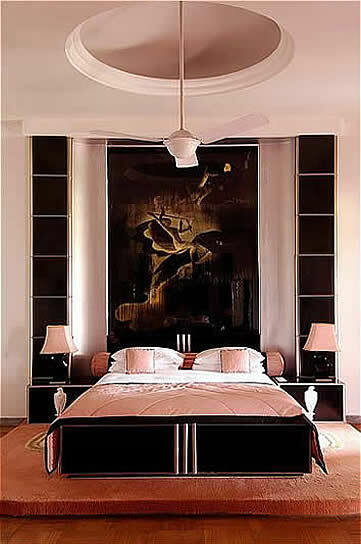 Address Circuit House Road (opposite Indian Oil petrol pump), Jodhpur 342 006.